Many times, when people hear about billiards and pool, another form of the game is often mentioned. This game, called Snooker, varies from the American form of pool. Though it is in the same group as the other cue sports, it actually stands in a league of its own. Aside from learning the different variations of pool play, some people enjoy taking that learning experience a step further and trying this well known game. In Snooker, the main object of the game is to score more points than your opponent. We are not used to the point system when playing billiards or pool, instead, we are more concerned with the ball count left on the table and the final sinking of the winning ball. Snooker is an entirely different game, with different rules, a different table, and, as mentioned, a different objective. Snooker is generally played on a table much larger than a pool table, measuring 6′ by 12′. There are also smaller tables, measuring 5′ by 10′, in which the game can be played. The larger size table is the most commonly used. The Snooker table have cushions that are more narrow than those of a traditional pool table, and they curve into the pocket openings. 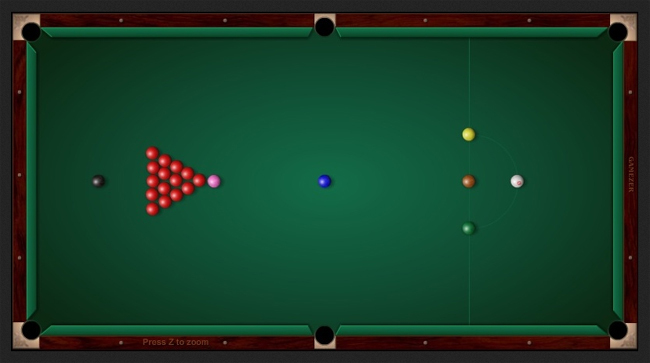 Like pool, Snooker is also a two player game. As mentioned above, the object is to outscore your opponent. This is done by sinking the balls with a higher point value. Snooker is played with 22 balls, as opposed to the 15 we are used to. These balls have no numbers, so the value of the balls are based solely on color. There are 15 balls that are solid red, six balls of different colors, and the cue ball. The point values for the balls is as follows. Red balls are worth one point, yellow is worth 2, green is worth 3, brown is worth 4, blue is worth 5, pink is worth 6, and black is worth 7. The rack is much different and the overall rules can take a while to get used to. There are many sites available online that will describe these things in great detail. The purpose here was to give an overview of the game.